The oesophagus and stomach are part of the upper gastrointestinal (GI) tract and the digestive system.The oesophagus is a long tube that delivers food, fluids and saliva from the mouth and throat to the stomach.The stomach is a hollow, muscular organ in the upper left part of the abdomen, located between the end of the oesophagus and the beginning of the small bowel (small intestine). The stomach stores food that has been swallowed and assists with the absorption of some vitamins and minerals. The stomach also acts to pass the food and water into the rest of the digestive system, including the small and large bowel, where most of the processing of food takes place. Mucosa – the moist innermost layer, which helps move food in the oesophagus. In the stomach it produces fluids that start breaking the food down. Submucosa – supports the mucosa and gives it blood to survive and take away any of the nutrients. Muscle layer (muscularis) –pushes food down the oesophagus. In the stomach it helps to mash the food up and assists with pushing the food into the digestive system in a controlled way. outer layer (serosa) – surrounds the layers of the stomach. It does not exist around the oesophagus. 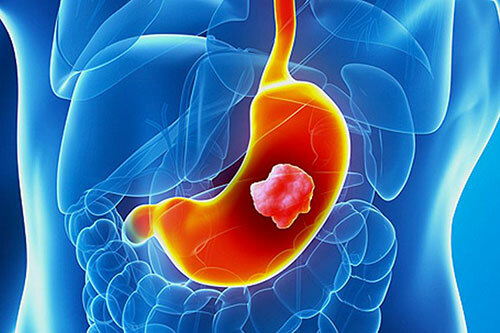 In the stomach, acidic (gastric) juices are released from glands in the stomach mucosa. These juices break food down into a thick fluid, which then moves into the small bowel. When the broken-down food is in the small bowel, nutrients from the food are absorbed into the bloodstream. The waste matter moves into the large bowel (large intestine), where fluids are reabsorbed back into the body and the rest is passed out of the body as a bowel movement. 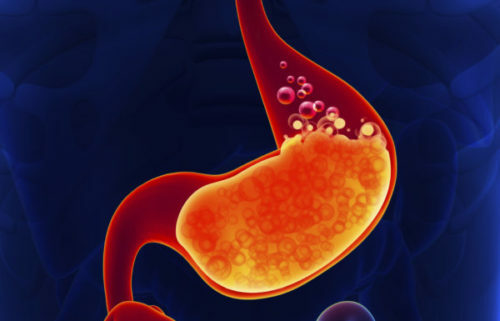 Gastro-Oesophageal Reflux Disease (GORD) is a common condition where the acid fluid of the stomach intermittently “refluxes” up in to the oesophagus through the Lower-Oesophageal Sphincter (LOS). 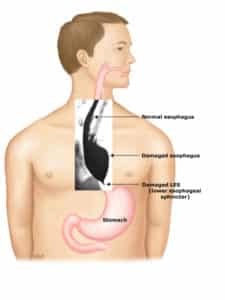 GORD, is a chronic disease occurs when the lower oesophageal sphincter does not close properly allowing stomach contents to leak back , or regurgitate, into the oesophagus. When refluxed stomach acid touches the lining of the oesophagus, it causes a burning sensation in the chest or throat called heartburn. Coughing especially at night, and can be severe and debilitating. 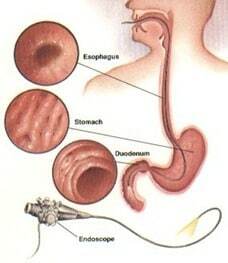 Also known as Gastroscopy this allows assessment of the foodpipe, stomach and the upper part of small bowel. 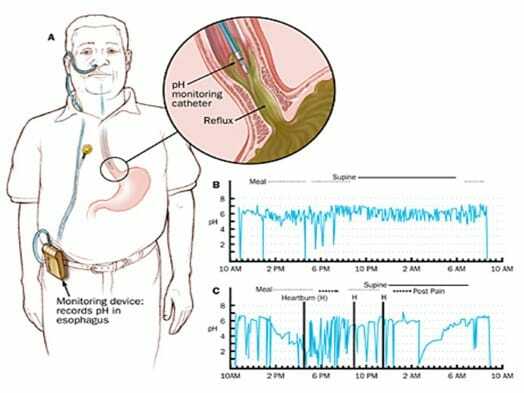 An Oesophageal pH study is regarded as the gold standard for quantifying the extent of reflux.